Mini-Basketball is a game of skill rather than strength; a mixed activity in which boys and girls are able to play alongside each other. The game offers the opportunity to develop the important skills of running, jumping, change of speed and direction, handling a ball, and shooting at a target. 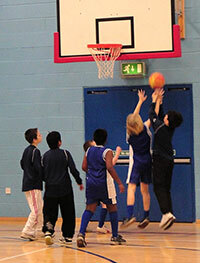 Registration with Mini-Basketball England is completely free. Direct support & guidance from Martin Spencer, MBE Education Officer. Up to date information on Take Six Mini-Basketball. News of local Mini-Basketball opportunities. Membership of Basketball England to include all benefits other than free insurance. Where can Mini-Basketball be played? Become a fully trained Val Sabin Licensed Mini-Basketball Trainer of teachers & student leaders by attending a one day training course. Read more about becoming trainer. Mini-basketball prepares children for a sporting lifestyle as part of their overall education and as an introduction to the sport of basketball. By modifying the basketball rules to suite the child we cater for the individual at an appropriate level for their physical ability, mental development and social maturity. A child's first experiences of playing a new game are often the deciding factor of whether they decide to continue in the game. Our aim is to ensure that players, teachers, coaches and leaders all enjoy a positive experience when they are first involved in organised competitive mini-basketball. We also need to ensure this enthusiasm continues as they go on to play basketball. Take Six' Mini-Basketball provides the link between curricular games and activities in lessons and club sessions, through to the full Mini-Basketball game rules. In Take Six Mini-Basketball children learn to officiate as well as play the game. 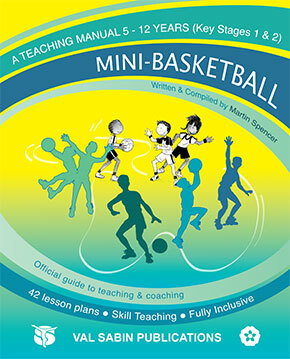 The official Mini-Basketball teaching manual for school teachers and coaches written by Martin Spencer, a world authority on the game. 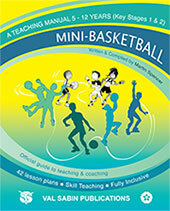 Fully comprehensive, it contains philosophy, rules and over 250 games and practices , together with National Curriculum programmes of study with 3 units of work (one each for KS1, KS2 and KS3) comprising 18 detailed lesson plans all in a progressive and developmental structure with learning objectives and expected learning outcomes. Assessment is addressed and a recording system is suggested. There is guidance for introducing the important role of refereeing to children as well as how to integrate Top Play and Top Sport activities into lessons. There is a special performance award scheme and photocopiable bookmarks and certificates to award as incentives.